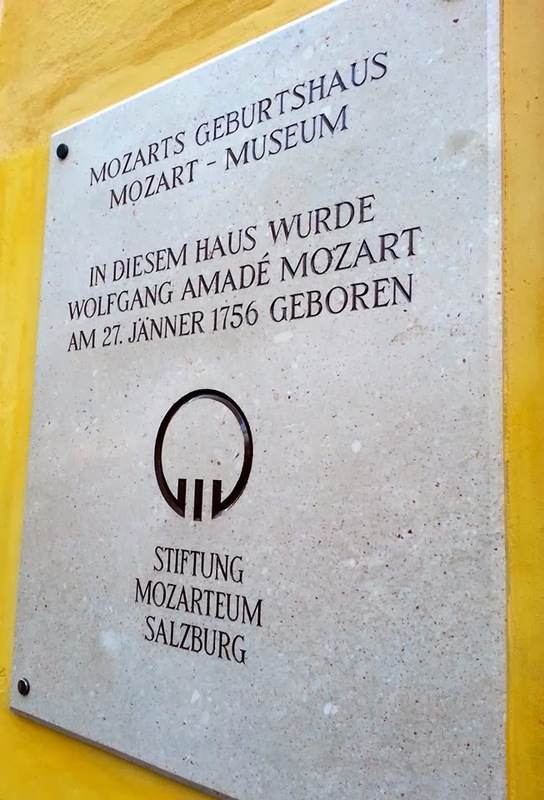 On Saturday, myself and four others took a short train ride to Salzburg, Austria and spent the day with Mozart, the mountains, and the selective February sunshine. During the two hour and forty-five minute train ride from Vienna, Emielia, Jenn, and I met the sweetest mother and son! Kasia and Ferdi (short for Ferdinand) were on their way to visit her mother just beyond Salzburg. Kasia works at an elementary school, and Ferdi is an eighth-grade student interested in computer science. We shared many stories and cultural differences with each other for the whole ride. As we neared Salzburg, Kasia invited us over for dinner sometime at her home fifteen minutes outside of Vienna. I was overwhelmed by the kindness, and just as I asked for her phone number, Ferdi whipped out the most adorable business card. It was a heartwarming train ride to say the least. We will be visiting Kasia and Ferdi soon. We arrived in Salzburg around 11:45am. 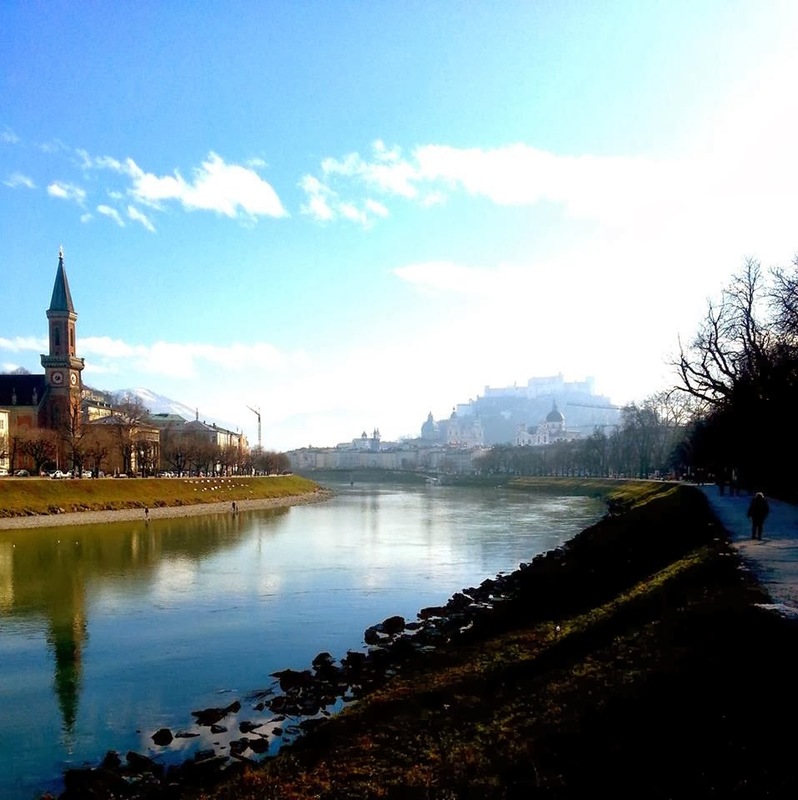 It was about a twenty-minute walk to the city center along the Salzach. Our first stop was to Café Tomaselli per recommendation of Kasia for an einspänner and some food. It was delicious and very Austrian. Next, we roamed through the streets, and ended up in a chocolate shop to buy some Mozartkugel. Mozartkugel is a signature of Salzburg and is made up of green pistachio marzipan, nougat, and dark chocolate. 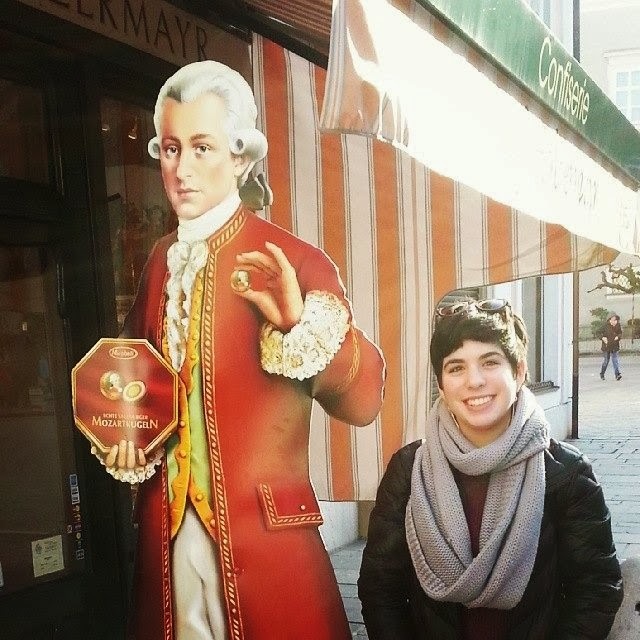 Here is a photo of a cutout of Mozart holding a Mozartkugel. After accomplishing the most necessary purchase of the trip, Emielia, Wyatt, and I went to visit Mozart's birthplace and museum. 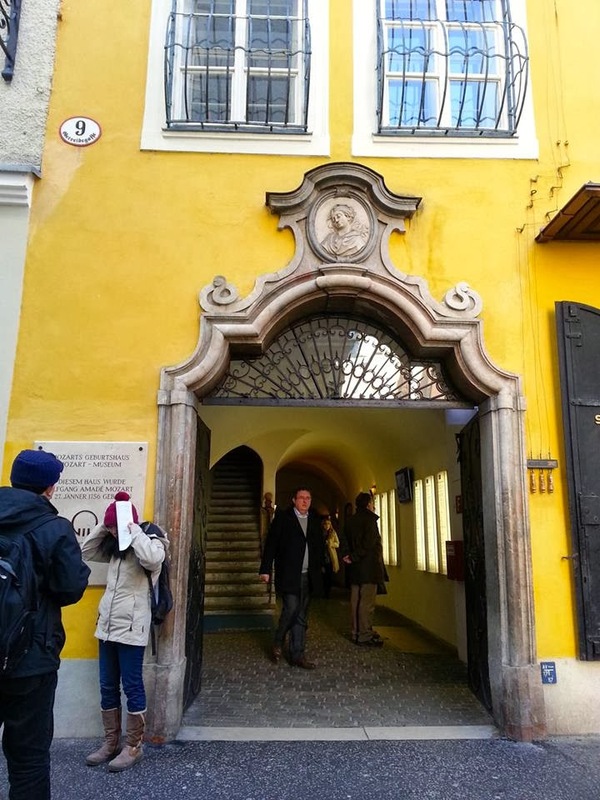 Not only did we get to see the rooms that he grew up in, his first violin, and various intriguing letters between family members, but there was an entire floor devoted to his operas - Le nozze di Figaro, Don Giovanni, Cosí fan tutte, etc. It was filled with scale models of various sets, set sketches and renderings, and costume renderings. There were also small booths in which video recordings of productions looped while the scale model of the set was displayed above the video screen. That was pretty cool. Of course the exit of the museum was through the gift shop, where I picked up a couple of cool postcards and a magnetic bookmark that reads, "I would like to have everything that is good, genuine, and beautiful!" by W.A. Mozart. The views of the city and the mountains surrounding the city were breathtaking. Each city I have visited thus far has had locations "at the top of the world" to admire the structures below. As I round the bend at each location, I am always stunned at the simple beauty of these European cities. 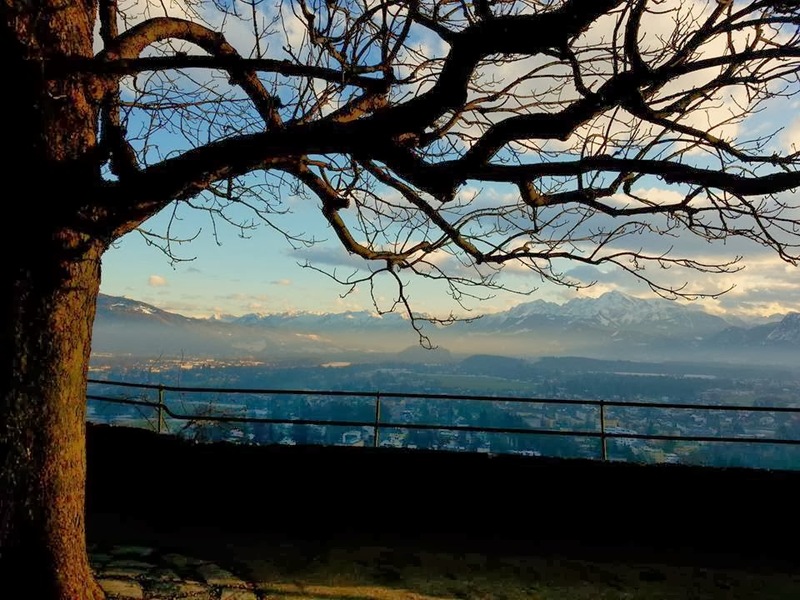 The tree frames the mountains so nicely! 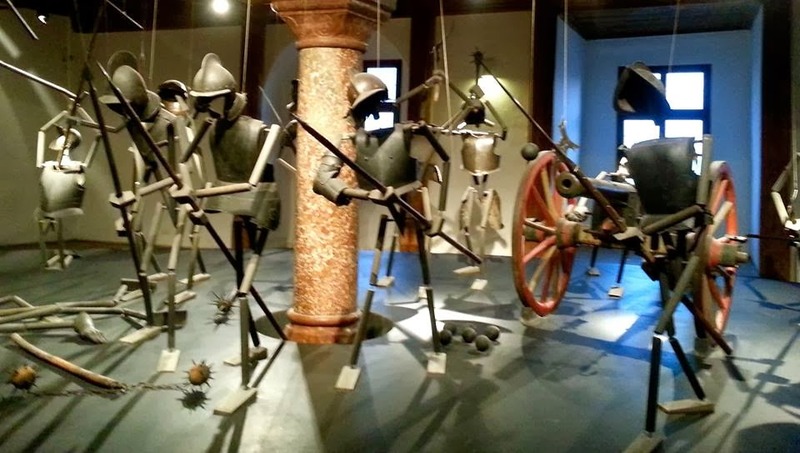 It reminds me of the famous marionettes in Salzburg. 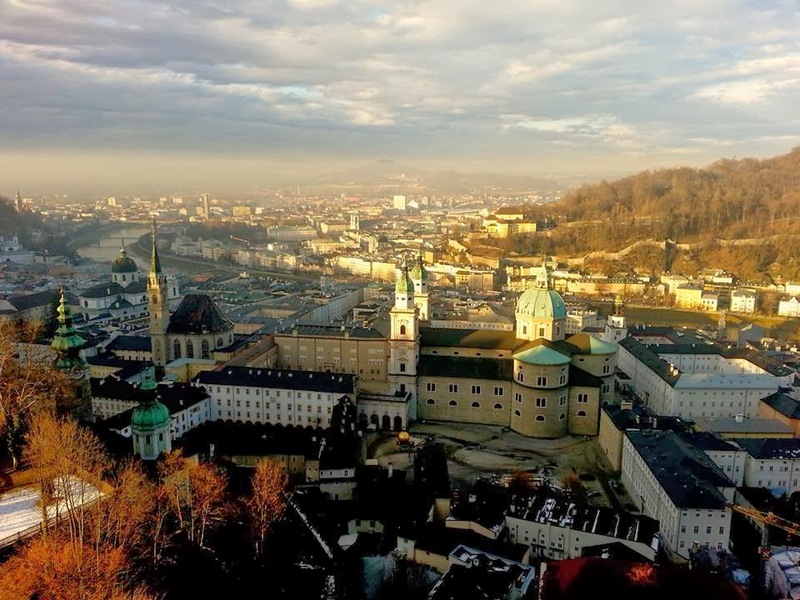 The Hohensalzburg Fortress is a must-see when visiting this wonderful city. The day trip concluded with dinner, a nice glass of white wine, and a peaceful train ride back to Vienna. I am visiting Budapest, Hungary this coming weekend!